Sancre Tor is a large fort north of Chorrol containing undead (quest-related). 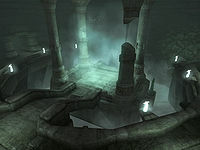 It contains six zones: Sancre Tor, Sancre Tor, Entry Hall, Sancre Tor, Hall of Judgement, Sancre Tor, Prison, Sancre Tor, Catacombs, and Sancre Tor, Tomb of the Reman Emperors. Sancre Tor is an Ayleid phrase meaning "Golden Hill"
Sancre Tor contains several hidden paths only accessible for the four ghosts. Sancre Tor also appeared in ESO. 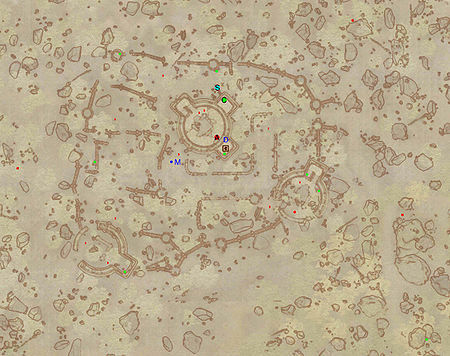 This location's map marker (M on map) is named Sancre Tor (editor name SancreTorMapMarker). The entrance door is ENE of the marker, 100 feet away. Originally founded and built by Queen Alessia during the First Era, the former city and legendary fortress of Sancre Tor stands as a historical monument of General Talos' defeat of Nord invaders in 2E 852 and as the mythical birthplace of Reman Cyrodiil. For unknown reasons, in the 36th year of Tiber Septim's reign, it was sealed shut by the Blades and gradually forgotten, decaying into a haunted ruin. During the related quest, your main objective is to reach and claim the Armor of Tiber Septim in the magically sealed Tomb of the Reman Emperors, but the road is long and hard, and during your long trek into the ruin, several long-forgotten secrets will be revealed. 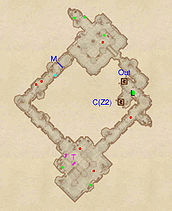 This first zone merely functions as an introductory and a quite linear path towards the nexus of the huge fort, Sancre Tor Entry Hall which can be reached through door C. Immediately upon entering, make sure to claim the Dagger of Sparks (a guaranteed magic item) from the skeleton at L, then proceed forward in a clockwise direction. 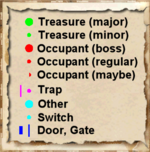 Beware of the Dart Trap (T) in the first large room and open the gate at M by pulling the nearby lever (cyan dot on map). In the large chamber to the north, dispose of the Undead Blade wandering the nearby bridge, which will summon the Ghost of Rielus who will give you several clues and then be on his way. 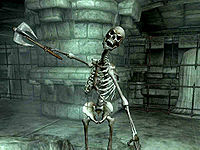 Search the skeleton and claim the unique Amulet of the Ansei, then follow the ghost through door C.
As Rielus told you in the previous zone, he was one of four Blades sent to the catacombs by Tiber Septim to discover the source of the evil infestation. The four were captured by the Underking, Zurin Arctus, and bound to haunt the catacombs after death. A spell was also put on the passage to the tomb where the armor lies. Approaching it is impossible without freeing all of the Blades. Upon entering the nexus from door C, you will face a large chamber with a platform raised above a pond of water, two Etheral Undead and entrances to all zones of Sancre Tor, including the Tomb of the Reman Emperors itself, which can be accessed through door H. Take a quick peek inside and observe the Ghost of Rielus kneeling in front of the magical barrier, already carrying out his duties. Return to the Entry Hall, and make your choice; There is an Undead Blade in each of the three remaining zones and all three must be freed from the curse put upon them. Door D leads to the Hall of Judgement, door E leads to the Sancre Tor, Prison and door G, which is located in the water below, leads to Sancre Tor, Catacombs. The Prison is the only dead-end zone, while the Hall of Judgment and the Catacombs are connected via easy-to-access doors within the zones. 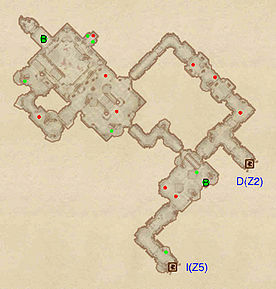 While the Prison is straight-forward and requires backtracking upon exploration, the most complete and profitable path between the remaining zones are suggested by your map marker, so follow that and enter Halls of Judgement through door D.
Unless you chose to ignore the map marker and explored Sancre Tor, Catacombs beforehand, you will enter Halls of Judgement through door D. Turning left at the first intersection will take you to door I, the entrance to the Catacombs, but there are several things to do before you do so; instead, take a right and follow the path counter-clockwise until you reach a larger room. Locate the southern entrance, cross the bridge and claim the contents of the boss leveled chest at B.
Backtrack to the large room and follow the path until you reach a large blood-soaked room, surrounded by statues. Here, you will encounter the Undead Blade guarding two minor loot chests in the northeastern alcove. Dispose of him and send the Ghost of Casnar on his way to the Tomb of the Reman Emperors. Loot the chests and make sure to pick up his sword, the unique, enchanted Mishaxhi's Cleaver. You are not finished yet, although the final part requires an incredible amount of Acrobatics, on the plus side of 100. Look up and locate the secret room high above ground; it is possible to reach, but only with fortified acrobatics. As such, make an attempt to reach it; if you succeed you will find a throne you can sit in and the second boss leveled chest (B). Otherwise, simply make your way all the way back to the bridge near the first boss chest, jump down and exit the Halls of Judgement through door I. The large prison section of Sancre Tor stands as a testimony to past battles and countless invasions and is filled to the brink with cells, most recently used by Tiber Septim to imprison the Nord invaders after recapturing the fortress. 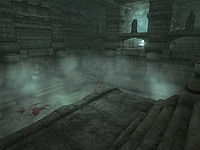 The very first room contains the only named inhabitant from the Septim era, Warden Kastav, presumably cursed by the Underking, and still wandering around doing his former job, guarding the empty prison area. He will attack you on sight and carries the key to the large door at M.
After dealing with Kastav, make your way through the relatively linear prison and make sure to check the numerous cells for minor loot chests. The Ghost of Valdemar can be found in the easternmost room, wandering around in his Undead state. Note that a few bedrolls can be located along the way, both of them at b. When you reach the Undead Blade, dispose of him and loot his unique and enchanted shield, then send Valdemar on his way back to the Tomb of the Reman Emperors. 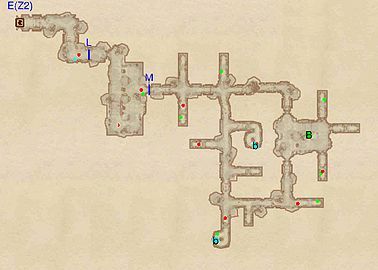 Finally, loot the boss-leveled chest at B and backtrack all the way to the exit at E.
There are two entrances into this zone; one from the water pond in Sancre Tor, Entry Hall at G, and the entrance suggested by your map marker, from Hall of Judgement at I. 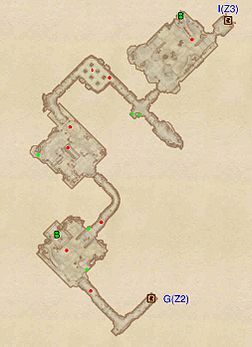 Regardless of your previous choices, this zone is entirely linear and your main objective is the Undead Blade guarding the boss leveled chest (B) in the very first room when entering from the Hall of Judgement. Fight him and watch the Ghost of Alain head towards his final duties in the Tomb of Reman Emperors. Make sure to pick up his unique sword Northwind before moving on. Because of the huge amount of treasure, take your time and explore the rest of the Catacombs; make your way through the tunnels and make sure to pry open the many chests you find. 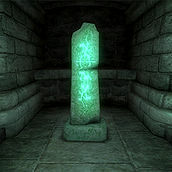 The southernmost room contains a huge altar with two of the runestones unique for Sancre Tor and, behind the stone coffin on this altar, another boss-leveled chest at B. Finally, return to the Entry Hall through door G.
This zone not only contains the target of the related quest, the Armor of Tiber Septim, it is also the final resting place of Reman Cyrodiil and the other emperors of the Reman Dynasty. These include Reman III, who was initially buried with the Amulet of Kings, later retrieved by General Talos after the battle of Sancre Tor. Talos, also known as Tiber Septim, gave his armor to the Blades as a token of his appreciation for their help during the attack. 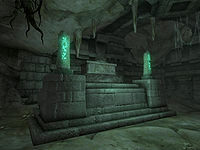 The Blades then built the Shrine of Tiber Septim in the Tomb of the Reman Emperors and later sealed off the entire fortress when the Underking corrupted the Shrine and populated Sancre Tor with undead minions. If you visit the Tomb before having freed all four of the ghosts, you will find the Shrine, located in the southernmost room, inaccessible due to four magical barriers put there by the Underking. You will take constant frost damage, be hit with the spell "Breath of the Underking", which drains Speed and Willpower and last, hit an invisible barrier at the end of the corridor. 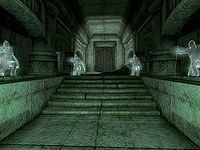 The epitaphs of Reman Cyrodiil and his first descendant, Reman II of Cyrodiil, can be read by approaching the Tombs on each side of entrance H; two additional tombs are present but the inscriptions are illegible. If you have freed the four ghosts, you can stand back and watch them kneel along the path and see each of the magical barriers at L, M, N, and O disappear. When the path is clear, simply make your way to the southern room and pick up the Armor of Tiber Septim from the stand at Q, and approach the tomb of Reman III for the last epitaph. Leave the Tomb of the Reman Emperors the same way you came; when you do so, all four ghosts will finally enter Aetherius and their curse will be lifted for all eternity.